mmmmmm, so nice to look at! I do really want more Pyrex and less plastic in my kitchen! Great finds –I love Pyrex too. And vintage tins. Must restrain myself at church sales until I can afford a bigger kitchen! 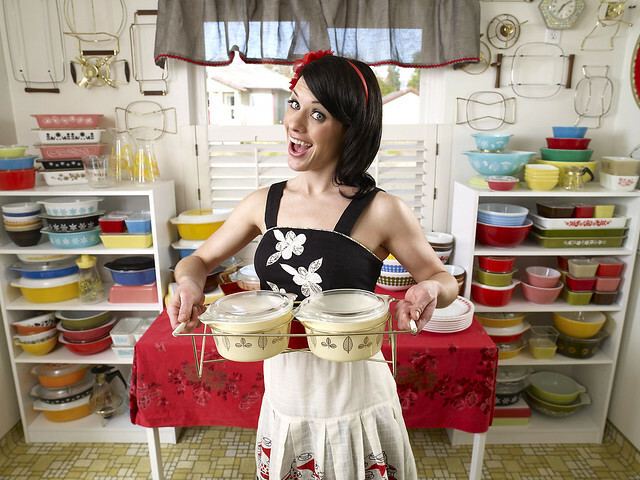 After delving into some American Pyrex collectors’ blogs, I informed Stuart that their husbands seem to just build them entire new kitchens to store their Pyrex in. He informed me that it’s definitely not going to happen. I have a love for pyrex, too. Not just the beautiful vintage ones (I have many) but also the utilitarian casserole, bread, and pie dishes. What I need to know is what you did to make the stackable ones stack like that. I have a four piece blue set (the Amish one) that I adore and want to copy you. Despite not having a place to display them. Ahem. I learned a very important tip towards Pyrex display here! http://www.southernplate.com/2013/02/pyrex.html Worked a charm.